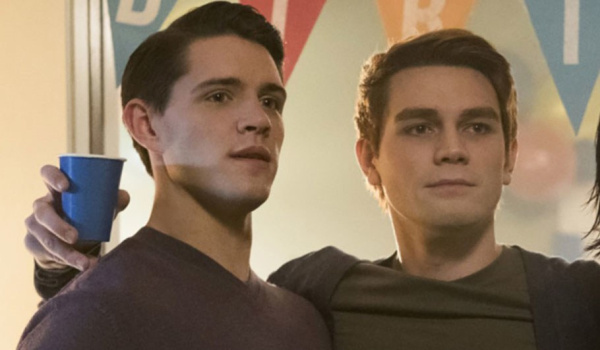 Fans of KJ Apa and his CW show Riverdale have been waiting for ages to see him kiss (at the very least) another guy. Not because his character is gay – but because he’s hot. Well, we finally got what we wished of. However… there are no happy endings here. Back in June, 20-year-old KJ Apa was speaking on stage at Oz Comic-Con 2018, where he said that he would “love” a relationship between his character – Archie – and the gay Kevin Keller (played by Casey Cott). Casey did get to lick KJ’s ear, but that’s it for now. Instead, we got a kiss between KJ and Rob Raco, who plays Joaquin, who used to be Kevin Keller’s boyfriend. Confused yet? We won’t even try to explain the plot – they’re both in jail, Archie thought Joaquin was his friend, but he’s really not, and there’s a strange game similar to D&D going on, but with real deaths, and… never mind. The kiss, however, ended with Joaquin STABBING Archie. Why, why hurt that perfect body? !